A quiet evening walk along a beach brings her face to face with a dangerous pale creature that craves much more than her blood. She is kidnapped to an island where the sun is eternally forbidden to shine. I’m still astonished! I’d never heard of this author before, actually I found her, by chance, on Goodreads and got captivated by her debut novel. 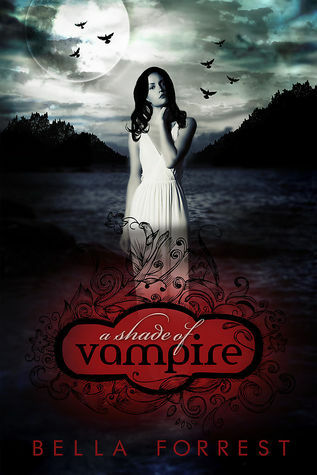 The art cover looks so gorgeous, and the synopsis left me suffering for the moment that I would finally read the book. A Shade of Vampire isn’t just a first book in a series but also the first published work by Bella Forrest; a small story incredibly well written and without any kind of slippery information that could, somehow, spoil the entire plot to readers. I was very pleased to see that this was not just another paranormal romance or another YA book, this story was—for me—very special. The author built a terrific world by combining in one single narrative two different genres that, in my personal opinion, are not only harmonized perfectly but also allows to both teens and adults to better appreciate what they’re reading. It was so easy to make a mistake and simply ruin everything, but Bella Forrest made her homework quite well and didn’t turn her book into an adult story nor a childish one. Again, the balance was way to perfect for that to happen. In 147 pages, we have a great story, with a well-built plot and amazingly developed characters that are rooted to their story. I’m so in love with Derek, he’s such a cutie! I’m also very excited with the idea of reading the second book, I believe that there are a lot more adventures and romance to happen. I hope Bella Forrest keeps her quality in the following book and that doesn’t get shaken by spotlight or by bad reviews (haters). If, in the beginning, it was the cover and the synopsis that made me want to read the book, now, at the end, I see myself completely surrendered to this story. Congratulations, Bella Forrest, for your wonderful book!